In both my personal opinion (as a cat lover), and professional opinion (as a veterinarian) I say keep the cat! 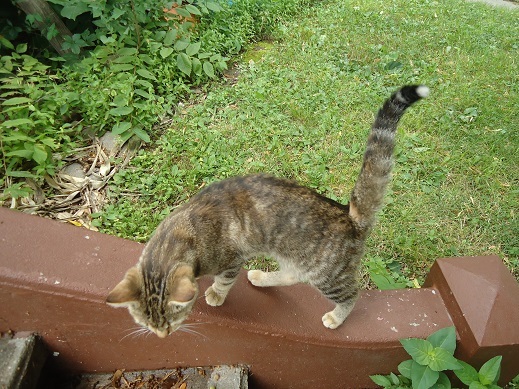 She will love you and help with the rodent and small mammal control. And I say “she” because of her coloring. – tabby with some calico mixed in. 99.99% percent of cats with calico coloring are female. So, take her in to the vet and get her vaccinated and spayed asap ????. We originally got our cat, despite me being allergic, to catch the field mice that like to come in and poop over everything in our house!!! Turns out we got the only cat in the world that is too lazy to catch anything. Lol! And then she got pregnant and had three kittens. And now is pregnant again. Maybe between all of these cats roaming around, our mice problem will go away?! Good luck with your bunny problems! Hi. Generally, I just lurk here, devouring your fun and informative blog quietly and with great appreciation. But cats … a new cat requires a comment from this cat lover. Laura? You’re funny … as is your new furry friend. I hope Wiggums lives up to your hopes …. and doesn’t make friends with the bunnies! Lol! 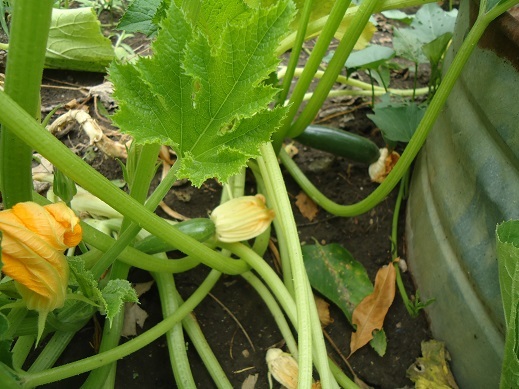 So I have a question about squash….I planted my first ever squash plant this year. It’s grown huge and had lots of blooms on it. 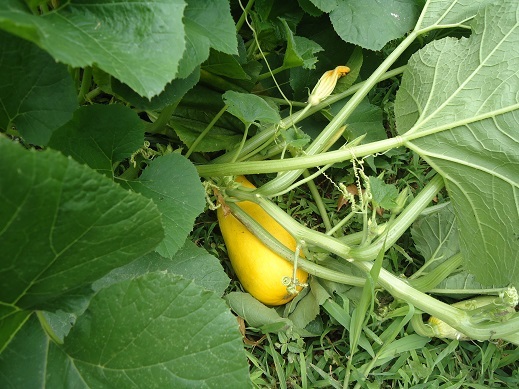 However, only 1 of those blooms decided to produce a very nice squash. What’s wrong with the rest of the blooms? Could be a pollination issue. Here’s an article all about how to tell the difference between male and female flowers (Seriously!?!) and hand pollinate them. Yay for the cat! I’m a cat person. We had bunnies in our yard when we moved in last year, but our dog has removed that problem. Our cherry tomatoes are getting nice and ready, and our herbs are happy. Raspberries, not so much, because all the rain ruined their tastes this year. About groundhogs…I’ve never dealt with them, but I know of a remedy that keeps all digging critters out of a garden…Hot peppers ground up and buried. Sounds crazy, but we tried it on digging dogs and squirrels and it worked like a charm. The hot peppers make their feet “hot” or burn. Even the smell tends to keep them out. You could try mincing several pounds of really hot peppers in a blender (definitely use gloves) and make a underground perimeter, if you’re interested. Just be warned…the cat will love to poop in your nice fluffy garden soil. I had to dispose of my whole onion crop because our neighbors cat kept pooping there. Nasty. I finally put up some posts and bird netting around my garden. Solved our bunny and cat problem fairly cheaply! 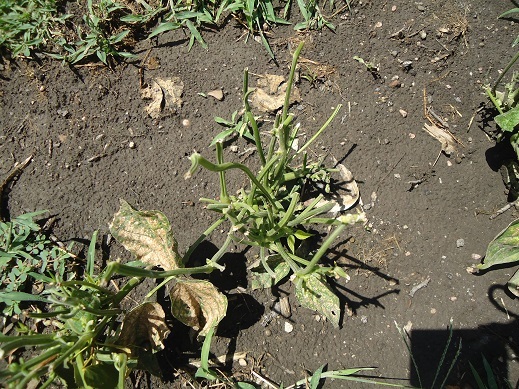 I came home from a 4-day trip to find the watermelon plant missing. I looked everywhere and thought I was losing my mind. I feel your pain. Squirrels too are naughty! We have a 2.5 acre cherry orchard. The squirrels ate 2.4 acres of cherries from said orchard!! They are not cute. At. All. We have a goat… she gives us milk. We have pigs… they will give us ham and bacon. Lots of lots of bacon! We have turkeys… they will provide us with our Thanksgiving dinner. We have chickens… they give us fresh eggs. And 30 unsuspecting roosters will give us many chicken dinners. And gallons of broth. BUT, not one of these critters will do a darn thing about the squirrels that ate our cherry crop! So we went out and got two barn cats. Barn kittens actually. Like fit in the palm of your hand size. They are growing, but still not quite as big as a chihuahua. They are crazy!! They climb all over us when we go in the barn (we don’t let them out yet as we are trying to let them get big enough to have a chance of survival against all the predators we have). Well, small as they are, they have already killed two mice in our barn! When they are big enough, we will leave a barn window open for them to come in and out as they please. Hopefully, they will chose to go out and kill lots and lots of squirrels! All this to say I encourage your cat efforts Laura! You may want to give him just enough food to keep him around, but not so much he doesn’t want/need to hunt :) And a place he can go for shelter incase of predators is always good. Like a garage. Or shed. Or barn. Laura, I was having a hard day, but you really made me laugh reading this! We have two cats that we found and adopted. One is a really good mouser and just caught another one in our garage a couple of days ago. The other likes catching and eating bugs. They are inside cats so they haven’t broken up the naughty bunny convention ( or naughty chipmunk, or naughty deer conventions for that matter) going on in our yard though. Now the neighbors got chickens and are letting them free range – in our yard! So, I am stepping in droppings with my bare feet. It’s always something. Enjoy your beautiful cat. First coffee, now a cat? I’m not saying you’re old or a dog but… this is a new trick! Also, what is it with God giving blessings that we would never think are blessings but that maybe just are anyway? Welcome to the family Wiggams. P.S. I hope you know someone or some farmer’s market with a large quantity of green beans because I hate to think of you green beanless through the less summery months. We also had a cat until this year. Someone had dumped our “Miss Kitty” a couple of years ago and we gave her raw milk to drink, that was all we fe dher. 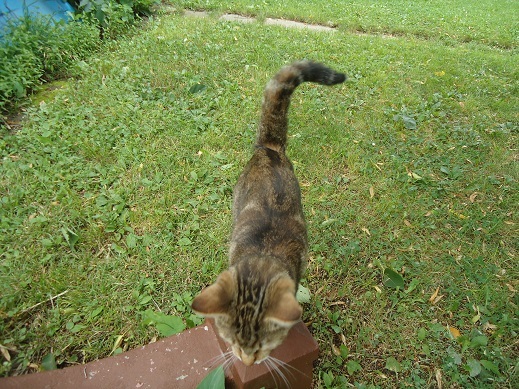 She was an outdoor kitty (at husband’s instistence) and she kept the chipmunks, moles, mice, squirrels and bunnies out of our garden. Where do I start? I love your posts. They make me laugh, and that is so wonderful, because who doesn’t need to laugh more in their day? Thank you so much for your humor!! Enjoy the cat! Looks like my “Winnie” from when I was growing up. I can feel her soft fur still, even after 30 yrs. We have a wee puppy, a 90 pd dog, 1 PET bunny , chickens, a turtle and 7, yes, 7 cats ! ! No wild bunnies bother our garden. None. No milk or string for cats. Milk will upset their stomachs and string can get caught in their intestines. Also see if his male parts are intact or have been clipped. If he needs neutering, there is likely a low-cost option in your area. I live in a small town as well and we have a $10 clinic. Also Wiggams might help with any mice/mole/vole problems you may have – unless he takes after the late Lady Galadriel, who liked to bring me presents. Alive ones. At 10pm. But out of the dozen or so cats I can remember, only two were like that, so statistically you’re probably okay. The bunnies and the geese wreaked havoc on our garden and yard when we were away, too! They munched all the pea plants to the nub, helped themselves to jalapeno plants, and the lettuce, what lettuce? However!!!! They did not eat the Serrano or habanero plants. Nor did they touch the carrots. (weird, since they are bunnies, after all). They got a bit too bold though and became an appetizer/snack for our german shepherds, so I suppose dogs will do in a pinch! Good luck with the garden. FYI, the gardens in Michigan are about as late as yours, so no worries. 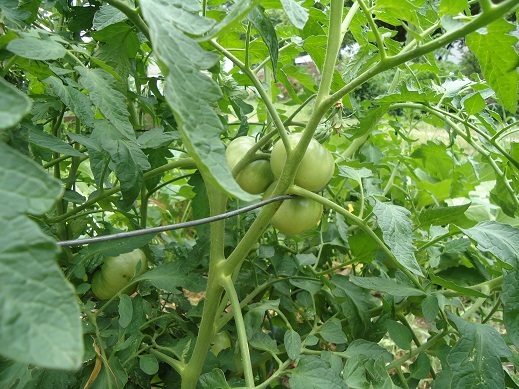 Besides, lots of green tomatoes = fried green tomatoes!!!! Ah, the joys of gardening. We have discovered that squirrels like every part of the cucumber plants and even cherry tomatoes (found that out last week) and possums will eat everything else. Wild cats have moved into our wood pile and have kept the squirrels population down and fixed our mouse problem…but their urine has ruined many herbs. The possums are bigger than the cats and remain undeterred in their quest for our freggies. Not the straw-stuffed, hang on a pole type in old shows….but a really cool infrared, motion sensing water spraying genius of a contraption. Hook it up to a water source, stick it in the ground facing your garden, and it blasts a spray of water from it’s sprayer and sends EVERYTHING running …even at night for those pesky possums. Heeheehee. We have to move it every few days for best results, as we have some intelligent Macgyver like squirrels that found the blindspots. It was well worth the investment!! If the cat doesn’t work out, the ScareCrow is a really good alternative. Good luck!